Merrick Garland Is Named As President Obama's Supreme Court Nominee : The Two-Way A former prosecutor, federal judge Merrick Garland will visit Capitol Hill on Thursday to begin meeting with legislators, Obama said. President Obama introduces Merrick Garland as his Supreme Court nominee Wednesday at the White House. Garland, 63, is currently chief judge of the U.S. Court of Appeals for the District of Columbia Circuit. The president officially named Garland as a Supreme Court nominee Wednesday as they stood before the media and a large gathering of attendees in the Rose Garden at the White House. 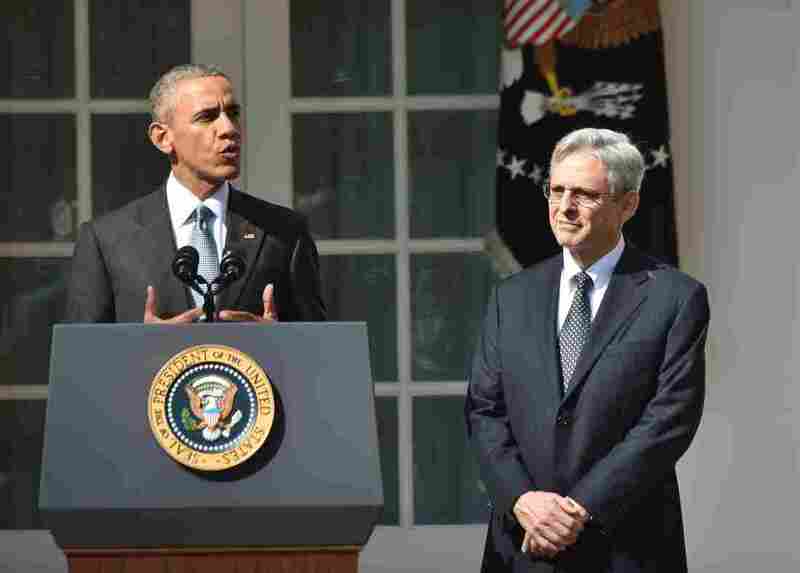 Addressing the refusal by Republican leaders in the Senate to consider a Supreme Court nominee, Obama said that in Garland, he had chosen "a serious man and an exemplary judge." He added that in discussions about Supreme Court vacancies — the current one, as well as earlier openings — "the one name that has come up repeatedly — from Republicans and Democrats alike — is Merrick Garland." After a more than 20-minute introduction by Obama, Garland received a sustained round of applause and spoke to the crowd in the Rose Garden. "This is the greatest honor of my life, other than Lynn agreeing to marry me 28 years ago," Garland said, growing emotional and pointing to his wife. "As my parents taught me by both words and deeds," Garland said, "a life of public service is as much a gift to the person who serves as it is to those he is serving. And for me, there could be no higher public service than serving as a member of the United States Supreme Court." After describing the importance of community service in his family, Garland said, "I know that my mother is watching this on television, and crying her eyes out. So are my sisters, who have supported me in every step I have ever taken. I only wish that my father were here to see this today." He added, "I also wish that we hadn't taught my older daughter to be so adventurous that she would be hiking in the mountains, out of cell-service range, when the president called." Chief Judge Merrick Garland in 2013. Garland, 63, is currently the chief judge of the U.S. Court of Appeals for the D.C. Circuit. A former prosecutor, he's also viewed as a moderate. And he has cultivated a reputation for openness and collegiality at the D.C. Circuit, a bench that's sometimes called the second most important in the land. Garland will visit Capitol Hill on Thursday to begin meeting with legislators, Obama said. After the announcement was made, Senate Majority Leader Mitch McConnell reiterated his pledge that the Senate would not take any steps toward confirming an Obama nominee. McConnell's fellow Republicans in Congress echoed his comments. Speaking on a sunny midmorning at the White House, Obama praised Garland for his "decency, modesty, integrity, even-handedness and excellence." With Garland standing beside him, Obama recounted the judge's bio, from his youth in Chicago to his sacrifices to go to college and law school — sacrifices, Obama said, that included Garland selling his comic book collection. Before becoming a judge, Garland occupied top posts in the Justice Department, where he oversaw some of the biggest investigations of the Clinton era, including the Oklahoma City bombing, the Unabomber case, and the Atlanta Olympics bombing. Obama made particular mention of the Oklahoma City case this morning, noting the diligence with which Garland pursued the case, as well as the care and consideration he showed to victims of that attack and their families — including carrying the program from a memorial service for the fallen as he worked on the case. The president quoted Garland saying that the case was "the most important thing I have ever done in my life." Garland has been a finalist for two other Supreme Court openings during Obama's presidency; he joined the appeals court in 1997, after a long Senate delay and a 76-23 vote. Today, Obama noted that Garland has earned bipartisan support for his work. In the past, the judge has won praise from senior Republican figures that include Utah Republican Sen. Orrin Hatch and Chief Justice John Roberts. The president's move to fill the seat left vacant by Scalia, who died just over one month ago, comes as conservative Republicans have pledged to block any attempt to fill the spot before a new president is sworn in next January. Garland's nomination opens a new chapter in what could become an epic and bruising fight over both the ideological tilt of the nation's highest court and President Obama's legacy. This morning, Obama called on the Senate to hold a fair confirmation hearing of his nominee, and to hold an up-or-down vote. Announcing his plan to fill the vacancy, Obama said, "it is both my constitutional duty to nominate a Justice and one of the most important decisions that I — or any president — will make." 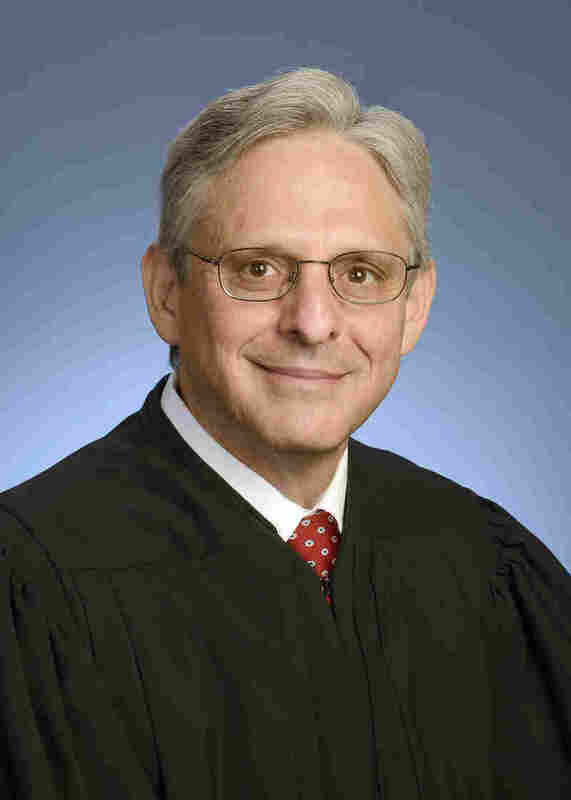 A native of Illinois, Garland attended Harvard Law School and was a clerk for Supreme Court Justice William Brennan. He then went into private practice at a law firm before taking a job as a federal prosecutor during President George H.W. Bush's administration. He and his wife, Lynn, have two daughters. Garland is "formerly a prosecutor; he ran the Oklahoma City bombing investigation; he ran the Unabomber investigation. ... The con is that because he has all that experience, he's 63 years old, and a lot of Democrats would like somebody younger than that, who presumably would be there longer than that." Srinivasan is "widely respected, has worked in both Republican and Democratic administrations. He doesn't have a long Court of Appeals record — but that's not enough to flyspeck very carefully." Watford "has been on the 9th Circuit since the first Obama administration; there were 34 Republican votes against him, but there were Republican votes for him. If he doesn't make it this time, I guarantee you his name will be in the mix next time." Nina also noted that when the Senate confirmed Srinivasan to the federal bench in 2013, it did so by a vote of 97-0. That standing, and his potential to become both the first South Asian and the first Hindu on the high court, led many to view Srinivasan as the favorite to be Obama's nominee. Once he's nominated, Garland will likely find a contentious reception in the Senate — but Nina said the outcome of the national election could shape that process. Referring to both Garland and Srinivasan, Nina said earlier this morning that if current Democratic front-runner Hillary Clinton wins in November, "the likelihood is that the Republicans would go ahead and confirm either one of these two men, on the theory that anybody Hillary Clinton would nominate would be more liberal." An "independent mind, unimpeachable credentials, and an unquestionable mastery of law." A recognition of "the limits of the judiciary's role." Awareness "that justice is not about abstract legal theory, nor some footnote in a dusty casebook." After that last point, Obama said he wanted a candidate who had experienced life outside academic or justice settings, so they would understand the way the law "affects the daily reality of people's lives in a big, complicated democracy, and in rapidly changing times." "I am fulfilling my constitutional duty," Obama said at the close of his message. "I'm doing my job. I hope that our Senators will do their jobs, and move quickly to consider my nominee." Ahead of Wednesday's announcement, the White House noted that the last time the Senate refused to vote on a president's Supreme Court nominee was in 1875 — and that "one-third of all previous U.S. presidents have had a nominee confirmed to the Supreme Court in an election year."